Welcome to the Mt. Pleasant Solar Cooperative! We are working with other communities to build a network of neighborhoods committed to solar energy and taking real action to reduce our dependence on carbon polluting energy. We are a member of Community Power Network, a national coalition of groups that support community-based renewable energy. We are a diverse and growing group of families and friends who want to help solve the global problem of climate change one neighborhood at a time — starting with our own. Mt. 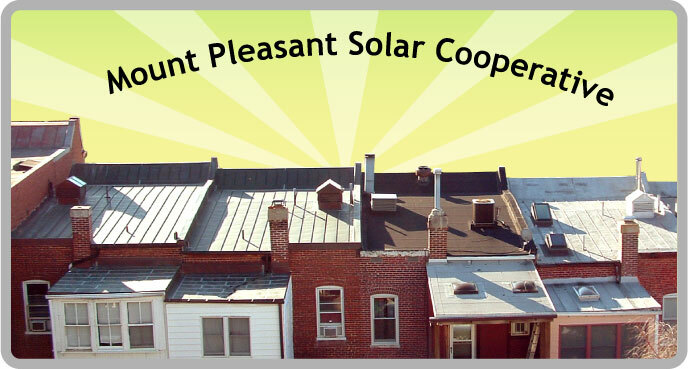 Pleasant Solar Coop aims to make rooftop solar power convenient and affordable for everybody in our neighborhood which is located in central Washington D.C. near the National Zoo. The Mt. Pleasant Solar Coop is a member of DC Solar United Neighborhoods (DC SUN), a coalition of neighborhood solar coops working to make solar accessible and affordable for everyone in DC. Visit DC SUN's website to learn more about our District-wide initiatives. We are also a member of the Community Power Network (CPN), a network of grassroots, local, state-wide and national organizations working to build, and promote locally based renewable energy projects & policies. CPN provides us with resources and serves as a strategic partner with some great causes. Visit their two key partners, Glowtorch.org and Project African Wilderness to learn more and join the network! We are not waiting for government or business to act on global warming. We are the change. Explore our mission and let us know what you think. Join an Existing Coop or Start one of you own! Let us know your ideas for tackling climate change in Mt. Pleasant. With your help, a solar-powered neighborhood can be achieved in the not-too-distant future. Mt. Pleasant Solar Coop is making news. When the D.C. City Council debates energy legislation, we speak up for homeowners and renters who want practical action to promote solar power. See why the Washington Post is paying attention.